The Tokuyo Maru No 11 was a fishing trawler. I have yet to find out its early history but I will as soon as possible. It is about 40 metres long. Its name on the stern is given as Tokuyo Mar with the rest unreadable. I was originally told that the name was Tokyo Maru No 11 but this is incorrect. After spending Spring of 1987 fishing, the Japanese owned trawler decided to take a break from fishing and spend the Christmas holidays anchored in the protection of a section of the Solomon Islands. On 24 December 1987 the trawler attempted to come in a passage near Ferguson Passage, between New Georgia and Ghizo Island. However, what they did not know was that the local natives were not overly happy with the Japanese fishing boats coming and "stealing" their fish and, as you will see later, probably not happy with other things they did ashore. So it came about that the locals had moved the starboard channel marker closer to shore by a hundred or more metres. The Tokuyo Maru No 11 came into to what it thought was a safe channel, with the starboard channel marker on their right hand side. The boat almost made it. So close. It scraped the reef top. So slight was the impact, the skipper and crew may not have even known that they had hit the reef. The coral had just touched the keel of the boat, only touching a section of hull about 750 mm wide and 500 mm long. However, this alone would not have caused the boat to sink as there was no hole put in the hull from this impact. The trouble came because the boat's depth sounder transponder was located at this location, and the reef caught on it. The transponder was pushed back 20 mm or so. This was enough. There was now a hole in the hull about 20 mm by 40 mm through which the water entered. The skipper of the Tokuyo Maru No 11 decided to anchor near the western end of Vonavona Island. The whole crew appears to have gone ashore to celebrate the Christian holidays and, so it is said, to have "fun" with some local ladies. They do not appear to have left anyone on board and the ship was therefore unattended over that night and apparently into Christmas Day. It appears that the ship gradually took on water and eventually it started to sink. I am not sure if it sank before the crew returned, but it certainly sank. Danny Kennedy, owner of Gizo's Adventure Sports dive shop was contracted to dive on the wreck for the insurance company. 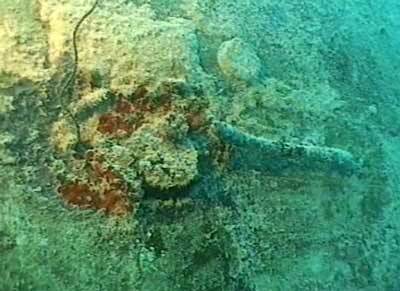 He salvaged the bell and today it stands in his house in Gizo. 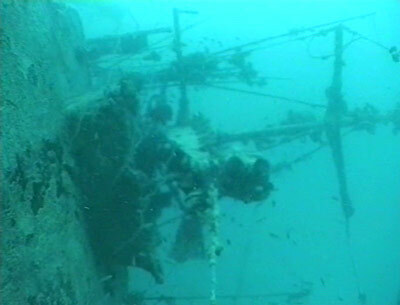 Today the wreck of the Tokuyo Maru No 11 lies in about 38 metres. The mooring is located at the bow. 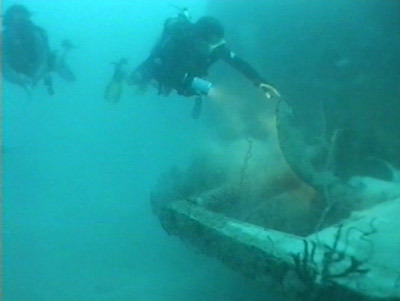 As you reach the wreck you see that the boat is lying on her port side facing north. The anchor is lying out towards the reef, disappearing off in that direction. The wreck is fully intact. As you swim over it you pass the bridge, the masts and other bits of the superstructure. You can enter the bridge area. The masts lie sticking out and make good photos. As you swim to the stern, you will see the fishing gear all over the place. There are also many small hatches, but it would be quite dangerous to enter due to the small size of the vessel. When you reach the stern you will see that the vessel's name can be clearly seen (well at least when I dived it). Back around to the hull and you will see that the prop and rudder are in place. Come back along the hull and you will see the transponder and the tiny hole that led to the vessel's demise. Discussions with Danny Kennedy, Owner of Adventure Sports, Gizo.